I Buy Way Too Many Records Dot Com: Overwhelming Colorfast / Stuntman - Split 7"
While I do not have the same sort of story time prose that I had for yesterday's Crocodile God 7", I have been searching and searching for this Overwhelming Colorfast/Stuntman 7" for an even longer time. It's all because of the Overwhelming Colorfast album Moonlight & Castanets. That album is another one of my all time favorite, but criminally overlooked and under-appreciated records of the 1990's. 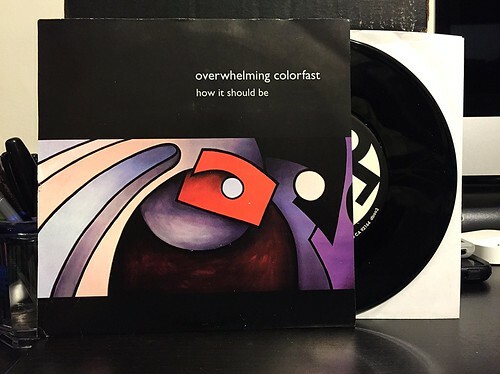 Overwhelming Colorfast is a band that employed those big powerful fluf-esque guitar riffs, coupled with Bob Reed's smooth vocals and a killer rhythm section. I don't understand why they didn't end up significantly more famous than they did. All three of their full lengths are well worth checking out, but Moonlights & Castanets has always been my top pick of the bunch. Funny enough the Overwhelming Colorfast song on this 7" is, I assume, an early version of a song that ended up appearing on Moonlights, "How It Should Be." It doesn't really matter to me all that much that I don't have a new song after finally acquiring this 7". Sometimes it's just the thrill of the hunt. Keep in mind I have been actively looking for this record since 1996. It came out in 1996 and even back then I couldn't find one anywhere. The Stuntman side is really just a bonus. Stuntman is a band that I never explored as fully as I probably should have. They came to be after Treepeople finally called it quits and their sound isn't too dissimilar to what Treepeople were up to on their later era albums. Their song "Chickens Don't Have Fingers" is a noisy, totally 90's, Archers of Loaf sounding indie rock song. Definitely good enough to make me think I should probably go back and re-listen to their other records. It's hard to remember a time when this 7" and yesterday's Crocodile God 7" were not on my records wants list. It's an incredible feeling to finally have both in the collection. But the number 1 record on my list is still out there. If anyone can help me find the first, self titled Love As Laughter cassette my longest hunt would finally be over. Cool. I'll keep an eye out for you here in Texas!